With some jointers and planers, changing blades is a tedious chore. Long ago, I struggled with the old spring-loaded jackscrew system on a jointer. Brutal. By contrast, changing blades on the Tersa cutterhead that was in the Inca jointer-planer was almost unbelievably easy and fast. The OEM system on the Dewalt DW735 planer was quite easy, and now with the Shelix cutterhead with carbide-tipped inserts installed, changing blades is practically a non-issue. The system for changing and adjusting the blades on the A3-31 is very good, though not quite the slam dunk of a Tersa. Each of the three blades has holes that neatly register on bosses on the blade holder, which is secured in a slot in the cutterhead with four hex socket screws using the provided T-handle wrench. (See the photo above.) This is easy to do, though a cutterhead lock would make it easier. If necessary, the blade holder-blade assembly can be adjusted for height with the four adjustment screws within the holder block. These can be used to make a consistent projection of the knife in relation to the outfeed bed across its full width. 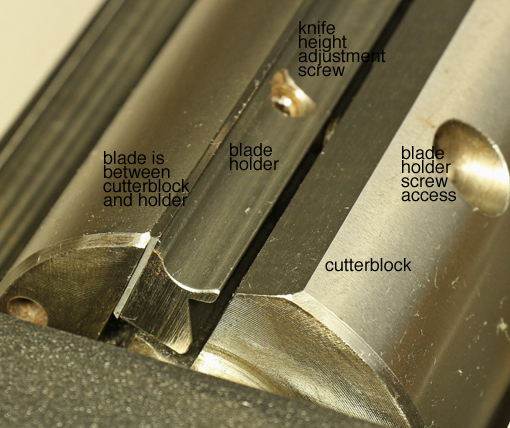 Further, the height of the outfeed table is adjustable to set its overall relationship to the arc of the knife edges. The factory settings, which I assessed when the machine was new and the knives were fresh, were excellent; no changes needed! So, when I installed replacement knives, everything should stay the same, right? Well, it worked out pretty well, maybe actually well enough, but not quite to my satisfaction. Somehow, despite great care on my part, gremlins sneaked in and I had to fiddle with the height adjustment screws to get an a consistent projection across the width. (This is not a matter of a difference in the overall projection related to worn versus fresh knife edges.) The manual explains a simple assessment procedure to help get it right and I am happy with the results. Note that perfection is not necessary for this. By the way, another option is the helical insert cutterhead available for the A3-31 from Hammer. Here’s the key: the machine performs accurately, consistently, and efficiently. I get the results I need to make high quality things from wood. This is what matters. 1. 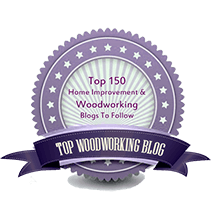 For the reasons explained in this series, I highly recommend a 12″ jointer-planer combination machine for the small shop woodworker. 2. After 2 1/2 years experience with the Hammer A3-31, I heartily recommend it. 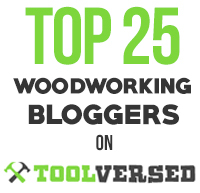 As with any machine, there are a few shortcomings (for this fastidious woodworker), which I’ve covered, but this is an excellent machine that can be a great partner as you pursue excellent woodworking. I cannot fairly compare it to corresponding offerings from Minimax, Jet, Rojek, Grizzly, and Rikon because I haven’t used them, and I’d bet the $7,000 Felder AD-531 outshines all of these, but I can say I’m very glad I have the Hammer A3-31. After following this series with interest since the beginning I thought I would share my experience at IWF this week in Atlanta. Even though I live here I usually can’t take time from work to go for three days (four if you include Saturday) but this year I was in a position to, so I did hoping to see the Hammer A3-31 live. If you’ve never been it will blow your mind. There must be 3 dozen or more manufacturer’s of large industrial CNC machines, and they all were running in the exhibit hall. Felder was there but they did not bring any Hammer products. They did have the AD 741, their 16″ Jointer-Planer, and it seems to be every bit as well designed and made, or better, as you describe for the A3-31. It was not plugged in but I still got a very favorable impression. The German sales rep spent 15 minutes with me even though I told him that I would not be in a position to buy for several years, (I need to build a new shop to have the space) and he even gave me a complete hard-bound catalog of all their products (heavy). All in all, glad you introduced me to this line of machines. Thanks, David. The Felder AD741 is about $10K, so I’m sure it is made to higher standards than the Hammer A3-31, which is to say it must be one awesome machine. Your IWF experience echoes what I’ve heard others say. It must be incredible. Keep in mind that my review is only about the A3-31. While I like it a lot, I am not able to compare it to the performance of current competing machines. If you are interested, please ask Hammer for the details on the Silent Power cutterhead design. The Byrd carbide cutter segments meet the wood at a slight angle to make a shear cut and also have slightly rounded cutting edges. These features help in almost completely eliminating tearout. I use Hammer’s cobalt HSS “system” conventional straight blades my A3-31. It’s really hard to put number on the longevity of the edges, and it would depend a lot on the types of wood you feed it, but my overall sense is the edge durability is very good.